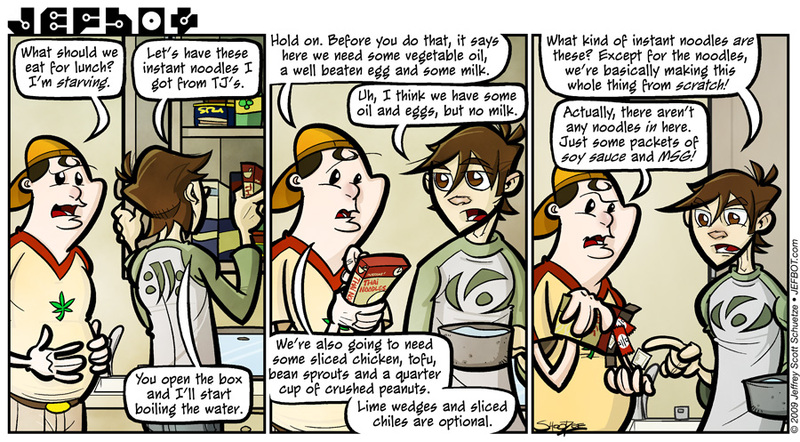 The events of this strip happened to me a couple of months ago – I was totally craving noodles and picked up a couple boxes of such at the local Trader Joe’s, only to find out, once I got home, there was a lot of prep work involved (the ingredients listed in the strip were lifted almost verbatim from the box directions). Those packages of noodles still sit on my food shelf, unopened. Now, granted, they didn’t exactly say “instant” on the package, but they were in the same section as the Top Ramen and Cup O’ Noodle, so I just assumed that I would be eating noodles, well, pretty much instantly. So consider this a Public Service Announcement: check your noodle packages before buying! The lunch you save may be your own. Also: Although we’re back to strips of the one-off gag variety, fans of the “JEFbot Mythology” storyline shouldn’t worry, as we’ll be returning to what happened to Mu, cel and the aliens soon enough! Consider the next several strips a breather before the next big arc. I see spam and peas in that pantry as well! 😛 And yes, I too have come across packages of noodle (side) dishes that I thought would be a quick side to make, only to find that it’s almost as if I have to make everything from scratch. Have to say that from the sound of things, that was gonna be an awesome noodle dish… but then again it could be that I have yet to eat as I just woke up. 😛 I like the little break from the story arc for a “semi-autobiographical” strip. 😉 😛 Can’t wait to see what happens next in the Mu alien abduction though! This was a cute one! good eye on the spam – i always have a can of that around, handy. and glad you liked this break. kind of a different creative process for these one-off strips, so it feels good to come back to it. btw, i’m totally craving Thai Iced Tea right now – i love that stuff. hope that’s on your food list. So, you guys want a Ramen? Good luck with that. Every time I cook I menage to leave incredible mess behind. Not that Im bad cook, mind you, I just happen to not posses aesthetic finnesse. Great facial expresion that Cornfather has on first picture. y’know, sometimes i just gotta have those instant noodles, Maryz. it must be the salt or MSG or crack they put in those things, but sometimes i must. have. glad you liked the Cornfather’s starving mug in that first panel. Ha! Hilarious. I’ve kind of felt this way about instant noodles since I was a kid, as the picture on those freeze dried cubes of ramen always showed noodle soup with all sorts of vegetables and stuff in it (serving suggestion). thanks, Stan. yeah, and even when those instant noodles have little bits of carrot or peas, they never rehydrate properly. no instant noodle gratification for you….it’s all in the fine print as they say. i demand noodle gratification, Hans!!! true. the Cornfather and jefbot could just add the soy sauce and MSG packets to some boiling water and eat that, Cemalidor. TJs is guilty of this quite often! Beware! Thanks for making me feel less alone in this. I thought I was just lazy and crazy! 🙂 Once again, gorgeous and beautiful work! Ah instant noodles, kept me going when i was a student, still keep me going when i’m broke. Seriously if you can find ‘decent’ noodles for less than 15 cents grab as many as you can. Although i usually just have a couple of packs with little more than the flavourings provided, i do occasionally get a little experimental. Sorry i haven’t been around to stroke your ego much lately, been studying for a four day course starting on Monday, i thoroughly enjoyed the beach story and the artwork as always has been awesome. yeah, i used to live off top ramen in college, Deaconvorbis. though i think the most experimental i’ve gotten is to throw an egg in with it, on Mombot’s suggestion. very tasty, indeed, JK. and satisfies my sodium requirements for the entire month. Hmm… all of a sudden I’m craving Phở. To ze Noodle Haüs! where is this “Noodle Haüs” Estiveo? Sorry, it’s about 400 miles North of you, real name Morgan Hill Phở We just call it ze Noodle Haüs because of a German friend who refuses to say Phở. And because we’re dorks. If you ever find yourself in Morgan Hill, it’s my treat. Being a dork doesnt mean the substitute name is wrong or bad, more often than not its just far too hillarious. I love it how you are with one group of people close to you and everybody knows what you are talking about and some time after that you are talking about pretty much the same thing to different group of people and nobdy understands what the heck are you getting at. Explaining it is half the fun. So I say, just go ahead and rename as much as you want. although some “inside jokes” are better left inside since 9 times out of 10, once you explain it, the funny goes away. ooOOooh, free meal! if i find myself in the area i’m definitely gonna hold you to that, E. and i’m gonna call it Noodle Haüs, cuz i’m a dork, too. OMG! Is that true? …next thing you know TJ’s will have us bring in our own bags and bag the food ourselves! “…Lime wedges and sliced chilies optional.” That made me laugh out loud, excellent set up! Jefbot, you rocked the comic world yet again! bagging the food ourselves? with our own bags!? that would never happen, Funnyshaffer. you’re just crazy. Yeah, ´shaffer is crazy. They soon will sell us packs or bags – and its the contents of those that would be our responsibility to provide. having married an Asian myself there are all manner of noodley products in my pantry. this has happened to us more than once. a pantry full of “noodley products”!? you are one lucky man there, Jed. Noodles. They may be the mankind’s most powerful invention. who the hell packages these things….Spartins? Seriously though, who puts this kinda crap on their. yeah, i wonder how many people have bought these packages thinking everything would be included in the box, ZL? I gotta confess I’m not much of ramen eater. Not my fav 🙁 I do love soup though, and mom taugh me how to do it with ham or eggs and it keeps my soup cravings calmed down. So funny strip, Jef. And as much as I love long story arcs, I do LOVE one-off-gag strips as well. Thanks for sharing your talent with the rabid fans! glad you like the one-offs – more to come! One of my favortie pasttimes when I shop there is what instant noodle is THAT? This is how I discovered that there are not only *cold* instant noodles, but that so far, they’re freakin’ delicious! I suppose I could ask for translations- folk there are very friendly, even though the store is PACKED EVERY time. But learning is half the fun. Mu is GONE! So’s MoMo!!! Why with the no freaking out???? yep, Mu’s gone – but MoMo remains! today’s comic takes place a couple days after that incident, hence we don’t have jefbot moping over his missing pet. i wanted to get back to some “stand alone” strips before getting into the next storyline so thought i’d leave it on a cliffhanger. don’t worry though – Mu’s fate will be revealed sometime next year! Hey! I just had a cup of instant as a snack before reading this. Awesome strip, as always. I haven’t had restaurant ramen in awhile. I used to visit a place called Orochon Ramen (I think that’s the place’s name) in Little Tokyo with friends, but I haven’t even had the need to go to Downtown LA in almost a year. So sad. I weep. Trader Joe’s lately has turned into a wild safari, you need a guide just to help you read labels now. i haven’t been to little tokyo in a LONG time, Foxmouse. i used to love Oiwake, that sushi restaurant that had karaoki at night. definitely need to go back sometime. and you ain’t kidding about the wild safari that is Trader Joe’s – just getting into and out of their parking lot is an adventure. yeah, and then we had those fancy “ready made” noodles in a box that weren’t so hot. i say we stick to what we know from now on. my mom used to call our noodles, “noodues”. is abraxas friends with mr. coconut and mr. munchies? if he is, i’m unaware, jj.